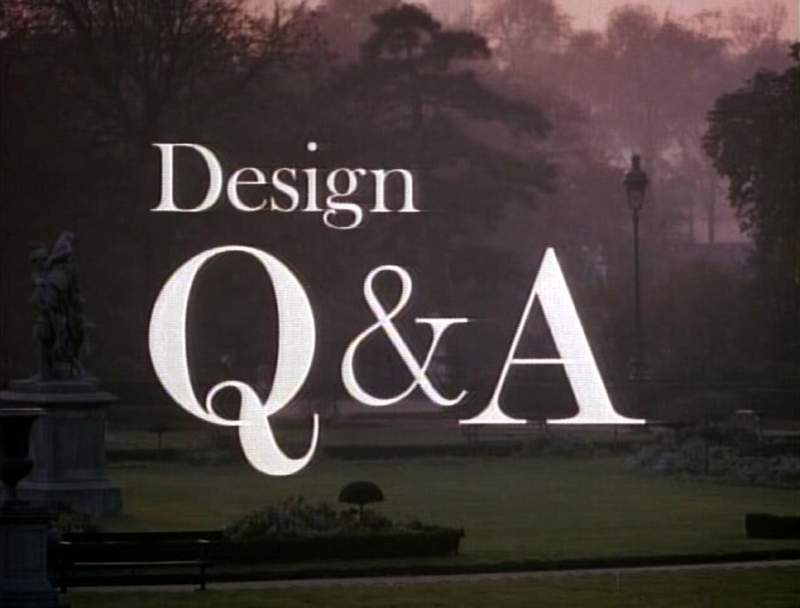 A film, made in 1972, that expresses Charles Eames’ approach to the design process. The questions and answers were the conceptual basis of the exhibition ‘Qu’est ce que le design?’ at the Musée des Arts Décoratifs, Palais de Louvre in 1972. Charles Eames (1907-1978) was an American architect who designed buildings and objects including toys and furniture, in association with his wife, Ray Kaiser. Questions by Madame. L. Amic, answers by Charles Eames. Q: “What is your definition of ‘Design,’ Monsieur Eames? The democratization of graphic design through liberating technologies such as Microsoft Word has created a situation where anyone can have a go at being a graphic designer. Posters, leaflets, booklets and other documents can be designed and printed in black and white or full colour at the desktop and then distributed to a waiting world. Andrew Keen, in an exchange with Emily Bell on the Guardian website in 2007, wonders “Is today’s internet killing our culture?”, decides that it is, and calls for “cultural gatekeepers” to safeguard our cultural heritage. As graphic designers, should we be worried about the cultural heritage of graphic design now that the ‘masses’ have the ability to produce quick, inexpensive design at the flick of a template? New technologies have liberated not only the man on the street but designers too. Not so long ago design happened in several stages: rough designs on paper which were then translated into more detailed specifications; casting off of type; typesetting; revising mistakes; pasting up as artwork; scanning and preparing plates then finally printing. Any mistakes along the way were expensive to correct and the quality of the end product depended, to some extent, on the abilty of the designer to communicate their ideas to the various professionals who facilitated the design from initial idea through to printed product. With liberation and the ability to revise designs at whim comes the double-edged sword of too much choice: with hundreds of typefaces to choose from and all accessible with a click of a mouse, is it not tempting to cruise through Font Book trying on typefaces like a rainbow of cheap Uniqlo t-shirts? And what of default design? Most criticism of desktop design is centred on presets and default fonts - as if Times New Roman loses its cultural heritage in the hands of non-designers or that presets or templates haven’t, at some point, been designed by a designer. Of course, non-designers (and ‘real’ designers) produce bad work - text that’s difficult to read: too long or short line length; bad tracking or kerning; too much or too little leading etc. The paradox is that good typography, as Beatrice Warde notes in ‘The Crystal Goblet’ of 1932, remains invisible or transparent while bad typography shouts out its presence like a Versace Home wine glass. In ‘The Rules of Typography According to Crackpots Experts’, published in Eye in 1993, Jeffery Keedy celebrates the “possiblities for the (imaginative) typographer that were unavailable ten years ago” and encourages typographers and type designers to look optimistically forward. Nearly twenty years later, many of the typefaces that Keedy designed such as ‘Hard Times’ or ‘Skelter’ and the designers such as Rudy VanderLans who used his work so imaginatively, have fallen out of fashion. One of the problems of graphic design - and one that is directly connected to the democratization of graphic design and the attendant cornucopia of choice - is the constant desire by designers to re-invent it in ever-more self-referential ways. Take for example Stanley Morison and Victor Lardent’s Times New Roman, released to great aclaim in 1931 and used for over 40 years in The Times, then cast out in the wilderness because of its associations as a default type in programs such as Microsoft Word. The font is now at the tail-end of a revival which has seen designers use it because after years of the ubiquitous use of Helvetica, Times New Roman suddenly looks ‘edgy’ and new. So, to return to my original question: are graphic designers “cultural gatekeepers”? Do we understand design better than the desktop publisher or do we merely have much better taste than him, setting styles and fashions that must be constantly revised in order to stay one step ahead?